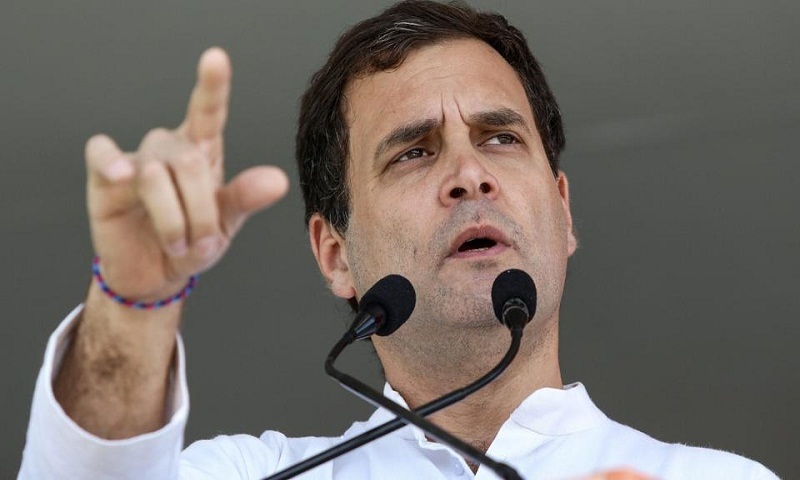 With Congress president Rahul Gandhi set to inaugurate his campaign in Chanchal in Bengal’s Malda district on Saturday, it is expected that the focus of his speech will be to target the Bharatiya Janata Party (BJP), his principal opponent all over the country. The other two parties in the quadrangular fight that Bengal is set to witness -- the Trinamool Congress (TMC) and the Left -- are Gandhi’s half-friends. In fact, Gandhi may find it a bit awkward to criticise both the TMC and the Left beyond a point. Though the Congress is contesting against both the TMC and the Left, Gandhi shares much-discussed opposition front space with West Bengal Chief Minister Mamata Banerjee. On January 19, the Congress president Gandhi and UPA chairperson Sonia Gandhi sent separate letters congratulating the TMC chief for the rally in Brigade Parade ground, where leaders from 23 parties vowed to fight against the ruling dispensation at the Centre. The Congress had also sent senior leaders Mallikarjun Kharge and Abhishek Manu Singhvi to attend the rally. The Congress extended the courtesy even though Trinamool chief Banerjee had not congratulated Gandhi after his party’s victories in the assembly polls of Rajasthan, Madhya Pradesh and Chhattisgarh in December last year. With the Left, Gandhi’s position may be even more delicate. Though the much-discussed understanding between his party and the Left is virtually dead in the state, a section of senior leaders from either camp are still openly saying that a pre-poll pact between them would have been the best way to fight the elections in Bengal. Incidentally, Gandhi’s last public rally in Bengal was on April 27, 2016 with CPI(M) leader and former Chief Minister Buddhadeb Bhattacharjee before the fifth phase of assembly elections in the state, when they jointly urged the people to defeat the Trinamool Congress government. This is just a tip of the challenge Gandhi faces in Bengal. There are other issues that he has to address as the Congress president. First, the party organisation is in disarray. Second, the party has lost as many as 30 MLAs in the state since 2011, when the TMC came to power. While 29 of those 30 legislators switched to the state’s ruling party, one went to the BJP this month, seriously eroding already weak support base in the state. However, the immediate challenge for Gandhi is to ensure that his party manages to retain the four seats that it won in 2014 elections. These are Malda North, Malda South, Baharampur and Jangipur. To compound problems, the incumbent MP from Malda North, Mausam Benazir Noor joined Mamata Banerjee’s party in January this year and has been nominated as candidate from the same constituency. The contest at this seat has become intense with the BJP nominating three-time Left MLA Khagen Murmu. Former President Pranab Mukherjee’s son Abhijit won the Jangipur constituency for the Congress in 2014, but with a thin margin of 8,161 votes. He won 33.80 per cent of the votes while the Left contestant won 33.07 per cent. Even Adhir Ranjan Chowdhury, incumbent and four-time MP from Baharampur seat, is not as comfortable as he was earlier. In 2014, Chowdhury won 50.54 per cent of the votes compared to a mere 19.69 per cent by Trinamool candidate Indranil Sen and romped home with a margin of 3.56 lakh votes. However, Mamata Banerjee’s party has made a lot of inroads into Chowdhury’s turf and he has seen some of his former loyalists leaving the party. In fact, the TMC candidate against Chowdhury, Apurba Sarkar, is one of his former associates. Sarkar was a former Congress MLA from Kandi. In 2014, Malda South was won by Congress candidate Abu Hasem Khan Chowdhury, who won it by a margin of 1.64 lakh votes and secured 34.81 per cent of the votes against 19.79 per cent won by the BJP candidate. The districts of Malda and Murshidabad were traditionally considered as the strongholds of the Congress till Mamata Banerjee led an assault on it. She deployed one of her most prominent party leaders, Suvendu Adhikari with the specific task. Adhikari managed the region quite well, attracting elected representatives from the Congress both at the levels of civic bodies and assembly, giving rise to the oft-repeated phrase of reducing the party “to a mere signboard in West Bengal”. But even beyond the limits of its former fortresses, India’s oldest political party’s fortunes in West Bengal have been constantly moving in one direction since the 1970s -- downhill. Led by Siddhartha Shankar Ray, a barrister and a confidante of former Prime Minister Indira Gandhi, the last Congress government in the state was in existence between 1972 and 1977. In the last five elections in the state – two Lok Sabha and three assembly polls – the Congress’s performance has remained at a low-level equilibrium. In the 2009 Lok Sabha elections, the Congress won 13.45 per cent of the votes and secured six of the 43 seats. Five years later, the graph dipped to 9.69 per cent of the votes and four seats. In the 2011 assembly polls, the party (contested in 66 constituencies) garnered 9.09 per cent of the votes and 42 of the 294 seats in the House. In the 2016 elections, though the votes crept up to 12.25 per cent, the number of seats remained almost static at 44. Incidentally, while the Congress contested the 2016 assembly elections (in 92 constituencies) with seat adjustment with the Left Front, its sworn opponent for decades, in 2011, the party had aligned with Mamata Banerjee’s TMC. In the 2006 assembly elections, when it went solo, and contested 262 of the 294 seats, the party won 14.71 per cent votes and won 21 seats, report Hindustan Times.